Edwin Valero stopped veteran Hector Velazquez after six rounds Saturday night to keep his WBC lightweight title in a town on Venezuela’s Caribbean coast. The 28-year-old Valero (26-0, 26 KOs) was bleeding from an eyebrow and his nose after a pair of accidental head-butts early in the fight. But the feisty Venezuelan kept attacking, giving Velazquez (51-14-2) his third loss in four fights. It was Valero’s first defense since winning the belt in April with a second-round knockout of Antonio Pitalua in Austin, Texas. 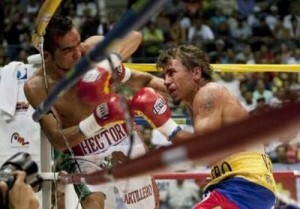 Valero is already planning to defend the title in early 2010 against Antonio DeMarco, who holds the interim WBC belt. Unification are given a great deal publicity but they are a very transparent gimmick. Say fighter AB wins the WBA and WBC flyweight title. He has to defend his belt, but both boxing organizations demand the fighter take on the highest ranked challenger. Which is almost never the same fighter. So when AB signs to fight one organization’s challenger, the remaining group strips him of the other title. The unification rarely lasts for long. The fight Saturday night was held just outside Caracas – Valero’s first fight since problems renewing his U.S. visa prevented him from defending his title in Las Vegas last month against junior lightweight champion Humberto Soto. Valero at the time accused the U.S. government of discrimination, saying he had completed all the necessary paperwork and that his application wasn’t approved in time because of his sympathy for Venezuela President Hugo Chavez – a fierce critic of the U.S. government. Valero has an image of Chavez tattooed on his chest along with a Venezuelan flag. Authorities say that Valero has a pending drunken driving charge in Texas, which is the primary reason he was denied a visa. I’ve blogged many times about the broken U.S. immigration system but in Valero’s case I believe his legal problems not his political stance is what caused him visa problems. Legal immigrants to the United States who haven’t acquired citizenship yet can lose their residency by being found guilty of a felony.